In my previous two blogs I shared with you the first 2 P’s of productivity – Practicality and Psychology – how are you doing implementing some of those strategies? Remember it’s what you do not what you know that makes the difference! The 3rd P of productivity is Physiology. Yes, your health definitely plays a critical a role in productivity. It affects everything, including how you think, feel and focus – so it will definitely affect the first two P’s of productivity. Getting into your absolute best physical condition will create increased energy, renew your focus and enhance your creativity. In addition to your overall fitness, moving regularly throughout the day, at least every 60 – 90 minutes if possible is also vital. Sitting for extended periods of time wrecks your body – it affects oxygen flow, which affects focus, concentration and everything else you brain is trying to do, as well as your overall energy. So get up and get moving and create triggers to remind you to do this if necessary. When are you best creatively, when are you most mentally alert, when is the house most quiet if you work from home, when do you have the least amount of interruptions, when do you get your best work done? If you’re not sure start paying attention to this and then whenever possible block your time accordingly so that you can do your most important and challenging work when you are at your best and leave the easier, more routine things for other times of the day. But also keep in mind what I mentioned in last week’s blog about how your brain’s capacity tends to drop as the day goes on so generally it is still always best to rather get the brain-power type activities done earlier in the day as opposed to later in the day. I even take this to the point of when in the week I do things – knowing that I’m better with doing the more challenging things earlier in the week and the more creative things later in the week when my capacity may not be quite as high. You may not have total control over this but leverage this as much as possible. Yes I know you’ve heard this before – probably thousands of time but are you doing it? Your brain needs rest and so does your body. Lack of sleep negatively affects energy, mood, focus, creativity, appetite, food preferences and hormone function. Essentially, it wreaks havoc on your mind and body. Establish the ideal amount of sleep you need. For me it is around 8 hours. Then reverse engineer your day. Know what time you need to get to sleep by in order to get your ideal amount of sleep. As with all else be consistent with this and create an evening routine to make sure this happens more often than not. So you may need to give up some of those late night shows or PVR them and really, are they moving you forward in your life to where you want to go or could that time be better spent? The better your body is hydrated the more energy you will have, the more focus you will have and the more you will get done – it’s that simple! How much should you be drinking? There are numerous variables to consider including your physical size, activity level, quality of your diet etc. but at the very least you should be drinking half you weight in pounds in ounces of water and this does not take into account hydration required during and as a result of exercise. For example, if you weigh 140 lbs the minimum amount of water you should be having is 70oz and again this does not include additional hydration based on activity level. And remember that caffeine and alcohol do not count. In fact the more caffeine and alcohol you have the more water you need to drink. So get that water bottle out, keep in visible all day and refill it regularly! The healthier you are the more productive you can be. Nutrition specifics will vary from person to person as we’re all unique but at the very least make sure you eat foods that will both fuel and nourish your body and your brain. How many of these Physiological aspects of productivity are you consistently doing? A couple are not going to get you to your highest level of productivity – you need to ultimately be doing all of them – but I also know that you need to start somewhere. What is the one thing you can start doing today? What is the one thing you can stop doing today? Yes this will require discipline but so does brushing you teeth and I’m hoping you do that everyday. So I invite you to start today, start now. Select ONE strategy from each of the 3 P’s of productivity – the ones you believe will have the greatest and most immediate impact on your life. Start doing them within the next 24 hours and do them for 66 consecutive days to develop the habit – modern science now shows this is how long it takes – not 21 days. And then as you master doing these, start adding on additional new habits that will help increase your productivity even more and as a result help move your life forward faster toward where you really want it to be. Don’t delay – get started now – it’s a choice – make it! 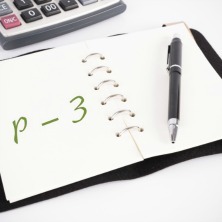 Previous PostIncrease productivity with the 3 P’s: PART 2Next PostWhat’s your mindset?